Lifeform Three is a fable in the tradition of Ray Bradbury, set in the near future, where global warming has shrunk the landmass and the countryside has been sacrificed for buildings and roads. One valley remains, of woods, trees and meadows, and is now kept as a theme park – The Lost Lands of Harkaway Hall. My main character, Paftoo, is a groundsman there. He’s the odd one out; the only soul who’s uneasy in a world that everyone else accepts. You could say he lives in a utopia – but to him it’s a dystopia. I knew the emotional beats of Lifeform Three before I knew the story. They came to me as pieces of music, a chain of albums and tracks that suggested the landmarks of the novel. I would load them into my MP3 player and take them running, puzzling over them as I pounded out the miles. Paftoo is a bod – an artificial human who’s programmed to do menial tasks. To keep him efficient, his memory is regularly wiped, but he has inklings of other memories. We meet him after such an event (known as a ‘sharing’). My first beat was that state of newness, a world shining and fresh where you go out and do your tasks, content with simple instructions. In the beginning, Paftoo doesn’t even know his own name until he realises the sole of his boot has a number – 2 (his name is an alphanumeric, short for Park Asset Field Redo Bod 2). Boards of Canada’s album Music Has The Right To Children told me the innocence of new, eager eyes, especially this track, An Eagle In Your Mind. The novelty doesn’t last long. There’s a wildness in Paftoo and by the end of his first day, he’s made the others wary of him. He’s also frustrated. But worse is to come when night falls. While his companions go dormant and lifeless, Paftoo starts to dream. Again, the idea came first as a feeling from music – Peter Gabriel’s soundtrack to The Last Temptation of Christ suggested a tingling in the nerves, a meaning that must be grasped. The dream sequence was choreographed to that album. It starts with a sense of unease, then that beat gallops in like the thing you knew was coming. Horses, flashing across the green hills in glorious gallop. Necks reaching, tails streaming. Riders on their backs, urging them faster. Paftoo opens his eyes, shocked. He knows he’s not supposed to dream. He also knows that nobody rides horses now. They’re untamed animals in the fields (and known as Lifeform Three). But at the same time it makes perfect sense in his restless soul. From that moment, Paftoo has a mission. Every night, he goes looking for clues that might explain why he has these dreams and what happened to him before his mind was wiped. By day, he struggles to hide his true nature in case he’s wiped again. In a small way the story is autobiographical. 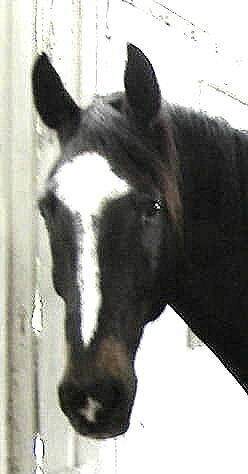 In winter 1995 I acquired a horse, which had been an ambition since I was a kid. Like the horse Paftoo later befriends, my horse was enormous, black and alarmingly excited to be alive – especially with the frost nipping his clipped skin. I was laughably incompetent on his back, especially when trying to stop him. While sceptical (and wise) folk waited for me to give up and sell him, I was determined to persevere. If I couldn’t handle my dream, what did that make me? That first winter, Enya’s Anywhere Is was in the charts. I wasn’t a fan of her music, but when I came to write Paftoo’s attempts to tame a horse I listened to Enya to capture that time. For some reason Caribbean Blue with its waltz rhythm brought back the sense of a wondrous adventure, the tentative courtship of a wild creature and the sense of being alone on a dumb-headed quest for something inexplicable and ideal. A song called Caribbean Blue that takes me back to an English winter, riding horses? 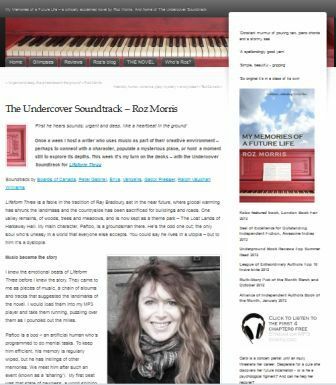 Like dreams, Undercover Soundtracks have a logic of their own. Or I take no notice of lyrics. During the writing, my soundtracks had to become a time machine. Those first days with my oversized horse were, as you can probably see, long ago. Reader, I kept him, and he was now reaping the arthritic rewards of a vigorous life. I was having ghastly conversations with the vet because if her treatments didn’t work it was time for the gun. I clung to those music tracks to help me give his glory days to Paftoo while the real situation seemed so hopeless. Thankfully, he rallied and we gallop on (on a good day). ‘gathering up the miles and throwing them out behind’. Electromantic La Baletta No 2 – by the Hungarian composer Gabor Presser had feisty, fertile joy, like a primitive spring ritual. It smells of untamed hair and corduroy. And whoever said electronic music lacked a soul? Both these tracks are entirely electronic, made from circuits and wave generators, yet they bound and leap like wild animals. But there’s a lot more to Paftoo’s quest than riding and nature. They are merely the beginning; the gateway to a profound discovery of his own past and the people and creatures he loves. Now I’m trying to avoid spoilers, but I can say that the more he recovers, the more he stands to lose and the more desperate his day life becomes. This impossibility was exquisitely insisted in Ralph Vaughan Williams’s The Lark Ascending. The piece was written in 1914 and 1920, in an England changed forever by the first World War. That period would also be the heyday of Harkaway Hall, the mansion that used to stand at the heart of the Lost Lands, where Paftoo now struggles to keep his memories. The Lark Ascending seems to say that what will be lost is more than just the loves of a few souls in a little story; it speaks for the loss of time, grace, of fallen walls in overgrown woods, bumps under the turf in an empty field. That violin seems to be shrilling from the skies: it won’t last. We won’t last. And how can Paftoo save it?